LionsDeal > Tabletop & Bar > Wait Staff Supplies >< Compartment Trays > Thunder Group ML803W White Melamine Compartment Tray, 13" x 9-1/2"
Thunder Group ML803W White Melamine Compartment Tray, 13" x 9-1/2"
The Thunder Group ML803W White Melamine Compartment Tray, 13" x 9-1/2" is a staple in any cafeteria or food service establishment. 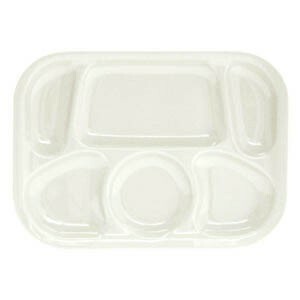 Designed with 6 compartments, this tray can hold an entree, sandwich, side dish, beverage and anything else. Made of highly durable melamine, this tray is shatterproof and strong enough to endure the rigors of heavy commercial use. As an added bonus, it is dishwasher safe and its fresh white surface will not get stained from frequent use.